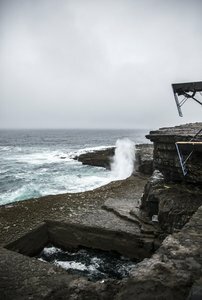 After months of training, preparation and exciting build-up, the 2017 Red Bull Cliff Diving World Series finally began at the tempestuous Serpent's Lair on Inis Mór, Ireland. Gary Hunt and Rhiannan Iffland kicked off their title defence in sensational style, overcoming the forces of nature and stamping their authority on this fledgling season from the start. Next up it's a trip further out into the Atlantic for a return to the Azores on July 9. Only an hour to go now before the first rounds begin here at Serpent's Lair. The divers are out taking a look at the location, and the weather here is a little windy but fine for diving. The men's 1st round is underway. They'll be completing their first two rounds before the women take to the 21m platform for their first two competition dives. So after round 2 it's Jonathan Paredes who leads the men's scoring going into tomorrow's finals. Blake Aldridge is second with Andy Jones in third. We'll bring you the full scores and standings shortly, but meanwhile the women are out preparing for their first two rounds. UPDATE: With the light beginning to fade here the decision has been made for the women to only complete one round this evening. That'll mean three rounds for them on Saturday now instead of the scheduled two. The athletes have just arrived at the location and action will get underway here with the women's second and third rounds at 10.25. Eleanor Townsend Smart, the wildcard and surprise leader after Round 1, will get the women's second round underway. The sun is shining finally, and apart from a little bit of wind the conditions are as good as can be expected in a location like this. Let's get going with the men's third round. Wildcard Igor Semashko will get things underway. We've just been told that Helena Merten has now joined Adriana Jimenez and Cesilie Carlton on the sidelines after injuring herself in the women's third round. That leaves us with five women competing in the final. Just a few sixes for Gary Hunt for that dive. He moves into the lead for now, but the reigning champion will have a bit of work to do in the final if he's to grab victory here. The legend Orlando Duque nails his dive and surges into the lead, but Jonathan Paredes continues his superb form here and is now in top spot heading into the final. Remember, only the top 8 men will go through to the final. And we're underway with the men's final. Can Gary Hunt follow Rhiannan Iffland and secure an important victory at the start of his title defence? Here comes Hunt with an action packed dive. What has the Brit got? 8.5s...superb! This guy makes everything looks so easy, and he cruises into the lead. Will he stay there?